Tom and Samir wheeling our bags to the Marrakech Airport. Today, we're posting the story we wrote last night from the airport in Lisbon, Portugal. With Internet issues at the airport we were unable to post it before leaving on the flight to Madeira. We arrived at our amazing new home at 3:00 am, only sleeping a few hours. Tomorrow, we'll begin to share details of our new home, new country and the new more modern environment. Flying is for the birds. They flap their wings and take off. But, for us two legged wingless human types, perhaps its just not meant to be easy. I should speak in defense of airplanes themselves. Generally, the flying in them is tolerable although a tight squeeze. It's the airport procedures, configuration and systems that are sorely lacking in providing us humans with a seamless means of transportation. The Marrakech International Airport is now #1 on our list of the most intolerable transit point in all of our travels to date. It's almost impossible to describe. Mind you, we knew flying was going to be our least desirable mode of transportation in our worldwide travels, preferring to cruise from location to location. At the moment, we rethinking our future plans to revert back to our original intent of using ships as our primary mode of transportation. The challenges include the financial aspect with the increased cost of cruising and the obvious geographical issues. The 30 hours of travel time from South Africa to Morocco was less stressful than the traveling the supposed six hours of travel time from Marrakech to Madeira which should have been an easy undertaking. After a tearful goodbye to Madame Zahra and Oumaima, the walk in the Medina to Mohamed's awaiting SUV out on the street was better than expected. A deep cloud cover rolled in allowing us to avoid the scorching heat of the sun. The drive to the airport was uneventful. Upon arrival at the airport, Samir dashed off to get a free cart while Tom loaded the carry on bags onto our wheeling cart. We headed inside the airport to the TAP check in desk. That's when the "fun" began. The bags. The overweight bags. The too many bags. TAP's website raved about their liberal baggage policy. We thought based on our research that there was a two bag allowance for coach. Both of us verified this. Alas, not the case. Only one bag is allowed per person. Now, if they operated as do many other airlines, they'd charge US $25 or $50 for each additional bags. That blow wouldn't have hurt much. But, the MAD 1800, US $220.24, to be paid in cash only threw us for a loop. Of course, this wasn't nearly as much as the US $1300 (approximately) we'd paid in Venice, Italy when we had more bags. In essence, we should be grateful. Then again, is one more grateful when one gets slugged in the face once instead of three times? Hardly. I would more than willingly palmed a US $100 bill into the agent's hand had he been alone at the desk. Alas, his cohort sitting inches away, with whom he was constantly conferring with in regard to our dilemma, made it impossible. All the fluff and diplomacy wasn't getting us out of this one. Although, I must add, he didn't charge extra for my overweight large bag after I did somewhat of a diplomatic dance. View of the outskirts of Marrakech. With had no choice but to go to a special desk to pay the penalty we were told the amount and that only cash is accepted. I could see the stress on Tom's face. Suddenly, both of us had to run to the toilette with a bout of intestinal distress. Gee...why weren't we more prepared for this? Why, after all of our travels do we not have a laissez faire attitude of experience and sophistication? Apparently, we do not. Returning to the original agent, we showed him the receipt, picked up our boarding passes and headed to the gate. He told us the airport had only "one gate" for all outbound flights. OK. We proceeded in the direction he pointed. Where was the "one gate?" Checking at an information desk, we received the same "one gate" answer. Deciding to sit down and recover from the stress, unsure of where "one gate" was located, we plopped into chairs, each of us taking turns running to the toilette. Two chatting non-stop toilette attendants blocked the doorway in an attempt to acquire a tip each of the four times I visited the toilette, including once to dump the iced tea from our mugs. No tip was paid. We proceeded toward the "one gate" but first had to go through security. Of course, we'd already dumped the iced tea in our mugs but the bottled water we'd just purchased for our parched mouths had to be tossed. Then, they didn't like the small bottles of shampoo and conditioner still in the duffel bag that we hadn't check after all, due to the cost. OK, all of this was normal so far. They didn't like the tiny bottle of insect repellent. Tossed that. They didn't like the metal designer label on the outside of my laptop bag. Couldn't toss that. They squawked about all of our power cords. Our hearts pounded with both of us easily remembering that our power cords were confiscated in Dubai and taken from our possession on a few cruises. I walked through the scanner without a beep when a female security guard literally grabbed and frisked me, even grabbing me by my Victoria's Secret bra. View of a peninsula on along the coast of Portugal. standing directly in front of it. As a result, we had to maneuver through crowded lines to find the sign marked Lisbonne (Lisbon). Tom suggested we sit in chair rather than stand in the long line. I agreed. To lighten the electrically charged air around us, I asked Tom how many dirhams we had left. Once we'd leave Morocco, they'd be useless to us. When he handed me the remaining 90 dirhams, chewing gum came to mind. Surely 90 dirhams, US $11.01 would buy one or two packs of gum. Nope, five stores later I was still in the gum-free zone. Finally, entering a fancy chocolate shop I purchased exactly 12 caramels for the 90 dirhams. Tom was needing a treat. A wide smile washed across his face when I handed him the tiny bag. Oh, would that food soothes us in times of trouble? I was so badly needing soothing that I could have sucked on my sock for comfort. Alas, I did not. As we waited in the long line, it finally began to move outdoors and we noticed passengers were being doled out from the line to walk the tarmac to an awaiting plane. It wasn't marked TAP airline. It was something else. Of course, thoughts flashed through our minds of boarding the wrong plane. Grabbing a agent's attention, I asked three times, "Is this the plane for flight 263 to Lisbon?" Each time I was reassured that it was. A short time later we board the incorrectly marked plane via the steep outdoor stairway. Why do all these airports have the telescopic tubes which they don't use? We've noticed this at most airports outside the US. Casablanca, Morocco as shown below Spain is not far from Portugal. Our load was quite heavy and bulky. I was carrying the pill bag and my oversized handbag both extremely heavy, stuffed with numerous peripheral items. Tom had to carry the wheeling cart which he had to break down to board, two laptop bags and the duffel bag, all heavy. Once onboard, we curiously looked for our seats. I was 5C, Tom 5A. They were two seats, next to each other, me on the window, him on the aisle. What happened to 5B? It didn't exist. Go figure. The flight was short, only 90 minutes and it too, was uneventful. We were served Subway type sandwiched and juice. Having not eaten anything other than a handful of cashews I cared not. I gave Tom my sandwich. He nibbled on each one, finishing neither. I'd have something to eat later in Lisbonne. Arriving in Lisbonne, all paths led to immigration. There was no less than 200 passengers in line with one immigration officer in a booth. We had 60 minutes remaining to make our 8:40 pm flight to Madeira. It looked hopeless. After 20 minutes another immigration officer entered a booth and a third managed the line. For some goofy reason we were grabbed from the line to start the new line for the opening of the second booth. The next challenge...would we be able to get a 90 day visa for Portugal? If not, we could easily go to an immigration office on the island after 30 days. Luckily, as we've experienced in most countries so far, except Belize, we are easily given the 90 day stamp. We've been told that getting a 90 day visa is somehow easier to obtain for US citizens. Why? We don't know. Lisboa as noted on this map is Lisbon. We're heading to Funchal on the island of Madeira, a 90 plus minute flight from Lisbon. Visas in hand, we made our way through the beautiful modern airport where I saw one US store after another, even the above mentioned Victoria's Secret. With no time or desire to shop, we made our way to the food court so I could eat something. First, we checked the electronic flight and departure board. Our flight to Madeira was listed as departing three hours late! No gate was specified. Oh, oh. Here we go! Finding a trendy restaurant we decided to get comfortable, go online using the free 30 minutes offered by Boingo. I ordered a delicious grilled chicken salad with little concern of getting sick from the lettuce. I hadn't had lettuce in 2.5 months. Surprisingly, the time flew by and at 10:00 pm, we headed to the "numbered" gate. Yeah for numbers! The flight on a newer Airbus was comfortable. Tom ate two more of the same sandwiches as on the first flight. We arrived in Madeira at 1:00 am, waited for our luggage and headed to the Alamo counter for our car, arriving to a slow moving line around 1:15 am. Tomorrow, we'll share our first wonderful experience in Portugal, at the Alamo counter inside the Madeira airport. More will follow with many new photos. Today, after only three hours of sleep for me and four for Tom, we're both pooped. We've yet to unpack or grocery shop. But, we don't want to miss out on cooking our first meal in two and a half months, here on the beautiful island of Madeira. The Treasury of the Lost City of Petra discovered in the 1800's. 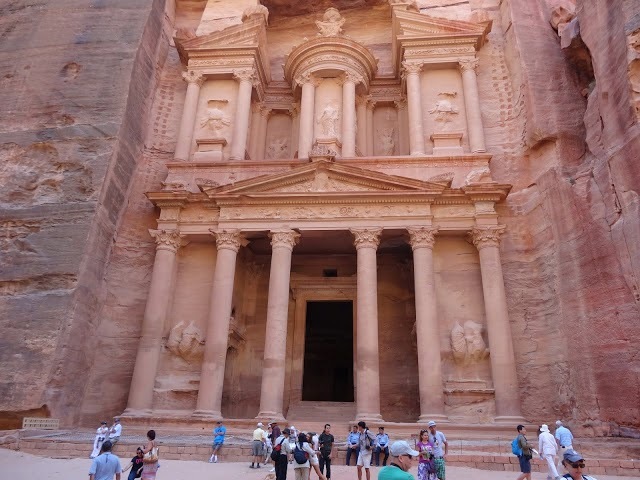 Here's our link for details of our day in Petra.